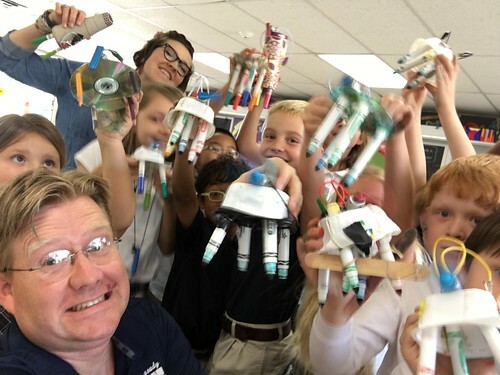 This podcast is a reflection by Dr. Wesley Fryer on some of the educational technology related challenges as well as aspirations he currently has as a school director of technology, technology integration coach, and after-school “STEAM Studio” co-teacher. These challenges include cultivating a school learning culture supportive of creativity, innovation, whimsy, and cross-curricular connections. They also include helping students transition into and succeed within a comparatively open-ended and less structured after-school learning environment, where they are invited to create, play, and express themselves while developing both digital literacy as well as artistic skills. Last of all, the challenges and aspirations include more “geeky” topics like planning for school infrastructure fiber optic line upgrades, managing bandwidth on a network with increasing numbers of IP-based surveillance cameras, learning about traffic and packet analysis tools, and firewall access reporting. Refer to the podcast shownotes for links to many of the referenced resources from this podcast including Dr. Mitch Resnik’s new book, “Lifelong Kindergarten: Cultivating Creativity through Projects, Passion, Peers, and Play” and the upcoming (October 2017) free online class “Learning Creative Learning” by the MIT Lifelong Kindergarten Group.